Yesterday My Other Half was on cooking duty. "Shall we have pizza?" he asked. Actually that wasn't a total cop-out. He always doctors them in such a way that they taste home-made. And how many of us have time to make pizza from scratch - apart from occasionally, at the weekend with kids and that's entertainment, not just meal preparation. I mean you can't start beating yourself up about pizza. He found a good bargain at our local Waitrose, not necessarily the best place to go for bargains - a giant Vegetable Fajita Pizza for £3.99 instead of £4.99. Maybe that was one innovation too far, even for Waitrose's gastronomic thrillophiles. It had - and I quote - "a crisp and airy base (quite nice, not unlike a focaccia FB) topped with subtly spiced tomato sauce and loaded with grated Monterey Jack cheese, chargrilled yellow peppers and piquillo peppers, finished with sour cream and sliced jalapenos." Italians - and lovers of the English language - would have shuddered but it was surprisingly tasty with the addition of some extra garlic, capers and fresh basil (also reduced) wilted on the surface at the last minute. It would actually have fed three, even four at a stretch but we managed to polish off the lot between us thus breaking one of the cardinal rules of frugal eating which is to remove potential leftovers at source so they don't get eaten up. Cheaper than a takeaway or going out for a pizza though. Who buys a pressure cooker these days? The world and his wife, it seems. And I'm wondering whether I should too. Will I actually use it, however? I don't normally ask this kind of question where gadgets are concerned, just plunge in, use them every day for a month or so, leave them lying around for the rest of the year then pack them away. But in new frugal mode this sort of profligacy is out of order. My food writer colleagues on the forum I belong to are loud in their praises. Some of them have had their pressure cookers for 30 years. I probably would too if I hadn't taken against them as a child when the smell of cooking dog meat (yes, that's what my mother used hers for) drove me gagging from the kitchen. They're also really expensive these days. Probably due to the Jamie Oliver effect (he endorsed one for Tefal) but most are available at half price on Amazon. Customers who bought the Tower 2824, which looks spookily like the one my mum cooked the dog meat in, apparently also bought the Official Strictly Come Dancing Annual 2008. Worrying, that. Is there an Unofficial Strictly Come Dancing Annual, I wonder . . . Yesterday would have been a successful No Food Shopping Day if I hadn't had a Baldrick moment and succumbed to a few turnips to go with the leftover lamb. They weren't cheap either - £1.34 for three. I remember turnips going for pence. But they were good. I cut up the leftover lamb, removing the excess fat and fried it in a very little oil until it was just beginning to crisp up, adding a pinch of the herb mixture I'd used when I roasted it the day before. Then I tipped in the leftover red wine sauce which had gratifyingly jellied. Instant stew. Incidentally, this works much better than the old method of heating the meat and the leftover gravy up together IMO. Cooked meat tends to absorb any liquid it comes into contact with leaving you with an unattractive spongey, squelchy texture - which is why I don't like the old fashioned method of making shepherd pie with cooked lamb. The 'fry first' method above works if you're making a curry from leftover meat too. Can you be frugal and ethical? Heated discussion over the lunchtable yesterday as to whether you can be frugal and ethical? I.e. if you're on the breadline you're not going to be fussy about whether your food comes from. It's been raised in connection with the Hugh Fearnley-Whittingstall/Jamie Oliver chicken debate and I can see it applies here too. Most people who are on a truly frugal lifestyle have a budget to stick to and don't go buying organic shoulders of lamb, even if they use every bit of it. Point taken. If I'm serious about this book - and this blog - we'll have to spend a week on a genuinely tight budget. No eating out (see yesterday's post) obviously. In the meantime I have to admit the lamb was great. I studded it with garlic, smothered it with dried rosemary and oregano, crushed with salt, pepper and a little cumin and roasted it for 4 1/2 hours, giving it an initial blast at 180°C/Gas 4 then turning the heat right down to 130°C/Gas 1. You have to keep pouring off the fat after a hour or so but the low temperature is great as it means the pan juices don't burn (so long as you chuck in some wine or stock once the fat has gone) and you get a brilliant tasty sauce at the end. I say sauce rather than gravy because I don't think gravy goes with this style of roast. I also found a use for the unloved spelt bread. Bases for the smoked haddock paté. Sliced it, cut it into bite-sized squares, sprayed them with olive oil and baked them. Problem was the oven temperature was so low it took them about 45 minutes to crisp up by which time they were the consistency of a ship's biscuit. Everyone gamely crunched through them hoping they wouldn't break their teeth on one. But I think it would work with a higher cooking temperature and shorter cooking time. Not that I'm going to buy that bread again. Phew! I was so busy planning and shopping and cooking yesterday I didn't have time to post. A productive day, though. I made a kedgeree with a third of the fish. Found I didn't have any curry powder so spiced it with turmeric, coriander and a pinch of cumin and chilli powder and served it with a cucumber raita. I folded the next third into a small amount of white sauce which I made from soy milk* as my husband is dairy intolerant. Infused the milk first with half an onion (used the other half in the kedgeree) which gave it a bit more flavour and grated in a bit of parmesan which curiously doesn't seem to upset him. This we can have on toast for supper tonight with more cheese on top like a fishy Welsh rarebit. With the final third I made a kind of smoked haddock paté/ brandade by blitzing the remaining fish with butter and a little milk, just enough to make it whizz easily in the blender and seasoned it with lemon juice, chilli powder, black pepper and a pinch of mixed spice. (No nutmeg or mace in the cupboard which would have been ideal). That will do for little hand-round toasts with drinks before lunch. So the fish will have stretched to 9 portions which isn't bad. There's also a very elderly loaf which is possibly rescuable for breadcrumbs if I remove all the crusts, cut into cubes and whizz up in the blender (can then be frozen) and some very heavy spelt bread which I can't for the life of me think how to use. Heavy ethical issue here - should you chuck away food you don't like? Blimey! It's hard work this frugal eating. * Incidentally it's much cheaper to buy soy milk off the shelf than in the chill section. Saved about 30p there. Tonight was supposed to be the first frugal meal of a well-planned weekend's eating but . . . er . . . it didn't quite work out that way. I worked flat out all day and didn't finish till 7. The temptation to go out was too great to resist. Feeling guilty I decided we should go somewhere reasonably cheap so we headed for the tapas bar down the road. We ordered five dishes* instead of our usual six and two glasses of wine in total rather than two each. Result a bill of £30 rather than the £40 we usually spend. 2) Just have one course. I think people are sometimes embarrassed to do that but it's a perfectly reasonable thing to do. Think of the French plat du jour. I shall see how well I manage to stick to these strategies over the coming weeks. * It would have been four but for the fact they had a dish of tongue in red wine on the menu which I thought I should research for the book. At least that was my excuse. Good, actually. Must try it. One up to 'im indoors! Back from London to find my other half beaming smugly. "Our dinner tonight cost 73p" he said. He'd been to the organic butcher down the road and found ox liver selling at a knock-down price. Only it wasn't ox liver, according to the girl behind the counter but vastly superior calves' liver which they couldn't call calves' liver because it came from an animal four days too old to be called a calf. He found a cos lettuce (or rather Sweet Romaine, as they insist on calling them these days) in the fridge and made a green salad from it so that didn't cost anything out of today's budget. It took 5 minutes to make and with no carbs was impeccably healthy too. Thought this was supposed to be my blog. Men are so competitive . . The main thing that stands in the way of my becoming a Frugal Cook is that I adore food shopping. Any excuse. And I'm incapable of coming away empty-handed. This obviously has to change and yesterday it did. We were out with friends last night and there was food in the cupboard and fridge so I didn't need to buy anything for lunch. We had spaghetti aglio, olio e peperoncino (a punchy spaghetti with oil, garlic and chillies) and a green salad. Later I managed to walk past our local food shops (we are lucky enough to have some at the end of the road) without dropping in. So I turned my back on some very frugal breast of lamb and some lovely fresh fennel. This was prudent because a) they wouldn't have gone particularly well together so I would have had to think of at least two meals to use them and b) I'm off up to London for a couple of days and would have probably ended up throwing out the lamb at least when I got back. (The fennel would have been OK but less good two days on). I'm learning. The problem with making soup from leftovers is that they invariably look murky. Yesterday's parsnips actually made a very good soup, along with some fried up onion, carrot and celery - and a generous sprinkling of cumin and coriander but it didn't look pretty. But you need to liquidise it to make it taste good. The answer, I think, is not to put too much green and red or green and orange into a soup which, as you'll remember from nursery school, makes brown. The proportions I used - 1 onion, 1 carrot and two sticks of celery - along with around 350g of cooked parsnip, I would guess (about 1 1/2 cooked parsnips) is just about right. "You will include lots of offal, won't you?" said my publisher. "You've got to use every part of the animal"
"Hmmmm". I said, thinking of tongues, trotters and tripe, none of them great favourites. "I don't think people are that much into offal these days"
"But this book is called The Frugal Cook"
"Tell you what" I said rashly. I'll go down the road and look in my local butcher. "If they sell them, I'll include them." Good news and bad news. They don't appear to sell tripe but they do sell trotters, hearts and tongues. And kidneys and liver, of course. I decided to postpone the tongue challenge and make a batch of stewed steak and kidney with portobello mushrooms. Ox kidney is unbelievably cheap - just over £2 a pound (450g) so I bought more than usual, cutting down the braising steak. It made the steak and kidney pie filling pretty gamey but with a fantastically good, rich gravy, I have to say, much helped by the addition of half a bottle of winter ale I happened to have had left over from Christmas. I decided not to put it in a pie as there wasn't time to cool it first (if you put pastry over a hot filling it goes soggy). And it makes the dish more flexible - you can either serve it with floating lids (see below) or with baked potatoes or a root vegetable purée. In the end we stayed too long chatting with the neighbours downstairs (my husbands ex-wife and her partner. True) and I ran out of time. So we ate it with boiled parsnips and stir fried kale. (Another great frugal buy - 32p for a large head, big enough for four). There are enough parsnips left over for a soup tomorrow lunchtime which is good. And leftover stew for tomorrow night. * To make floating pastry lids, take a pack of ready-rolled pastry out of the fridge, let it warm up a bit then unroll it. (If you try to unroll it straight from the fridge it cracks) Cut it in half lengthways then divide each piece into three equal sized rectangles. Transfer to a baking tray(s), brush lightly with milk or beaten egg then prick all over with a fork to stop the pastry ballooning up. Bake in a pre-heated oven at 220°C/425°F/Gas 7 for about 5-6 minutes then turn the heat down to 190°C/375°F/Gas 5 for another 6-8 minutes until well risen and nicely browned. What - and who - is The Frugal Cook? Frugal cooking may mean different things to you than it does to me. It's not just about cheap meals and ingredients, it's about making the maximum use of everything you buy. Not - for those of us who are meat-eaters - insisting solely on using the most expensive cuts of meat but every edible bit of the animal. Buying fresh produce in season when it's cheap and tasty rather than having it flown half way round the world. Making use of what's left over from meals rather than leaving it to fester in the fridge then having to chuck it out. It was an idea that was popular in the '70's but things have changed a lot since then. For a start we all have a lot less time - or are less prepared to spend hours in the kitchen. Ingredients - and tastes - have changed. We're familiar with exotic dishes and cuisines we couldn't have imagined then. But the downside is that we've got into the habit of stacking our storecupboards with new ingredients every time we try a new recipe. We've lost the habit of thrift. Over the next few months I'm going to try and curb my own desire to go food shopping and instead find inventive ways to use the ingredients I already have. When I cook I'll cook with a view to creating leftovers for the next day - and even the day after that. Hopefully it won't be too tough. I've already written three student cookery books called Beyond Baked Beans, the most recent of which, Beyond Baked Beans Budget was very much focussed on economical eating. I've got my own website www.beyondbakedbeans.com which carries recipes and tips for students, singles and others on a budget. 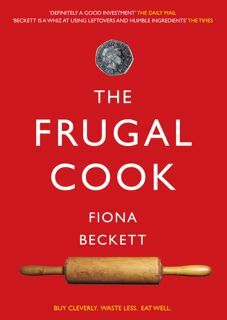 Like every other book I've written, The Frugal Cook will be a voyage of discovery. Come and join me on the ride . . .